Unlike traditional detection methods, Syntech ONE automatically detects individual gun components using artificial intelligence. Artificial Intelligence (AI) security and defense company Synapse Technology today announced the release of the Syntech ONE® 200 Series, the first patented AI platform for existing security X-ray machines. Osaka Airport ordered Syntech ONE 200 for multiple passenger lanes, becoming the first airport to deploy true live AI technologies for baggage screening. 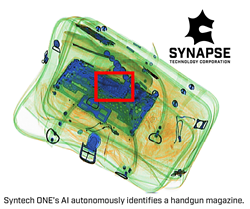 Synapse Technology is making life safer and more convenient with AI software that can automatically detect weapons, knives and other threats at airports, concert venues, schools and secure facilities. Synapse Technology’s flagship product, Syntech ONE, is the world’s first patented and commercially available AI-based threat detection system for security X-ray machines. Instead of relying solely on human screeners to identify threats, Syntech ONE augments and automates the detection of multiple dangerous weapons and items using state of the art artificial intelligence and computer vision. Syntech ONE has already been widely deployed, having processed over 6,000,000 passenger bags at security checkpoints around the world. The US Department of Homeland Security (DHS) also recently granted Synapse Technology Corporation a SAFETY Act award for its technology platform. The 200 Series represents the first broadly-available plug-and-play system that is compatible with new and existing X-ray security systems from leading manufacturers including Rapiscan and Smiths. Customer do not have to endure costly replacements of their current x-ray technology to garner the performance benefits of Syntech ONE. The patented 200 Series system is designed to increase the probability of detection of threats while speeding up throughput at security checkpoints. Synapse’s AI platform also leverages “big data” techniques to provide frequent enhancements, including additional machine capability and additional item detection. Syntech ONE Series 200 units are currently available and ready to deploy. Contact sales (at) synapsetechnology (dot) com for more information. Synapse Technology Corporation LogoSynapse Technology Corporation Logo Unlike traditional detection methods, Syntech ONE automatically detects individual gun components using artificial intelligence. In this example, the AI autonomously identifies a handgun magazine.Unlike traditional detection methods, Syntech ONE automatically detects individual gun components using artificial intelligence. In this example, the AI autonomously identifies a handgun magazine.